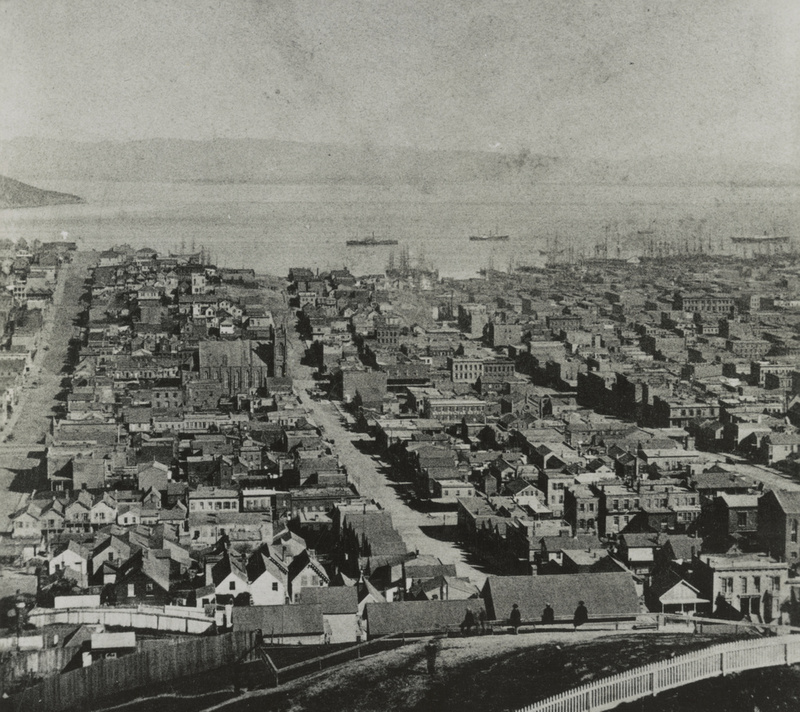 The view looking east from the top of Russian Hill, looking down Vallejo Street and facing San Francisco Bay, around 1866. Image courtesy of the Library of Congress, Lawrence & Houseworth Collection. 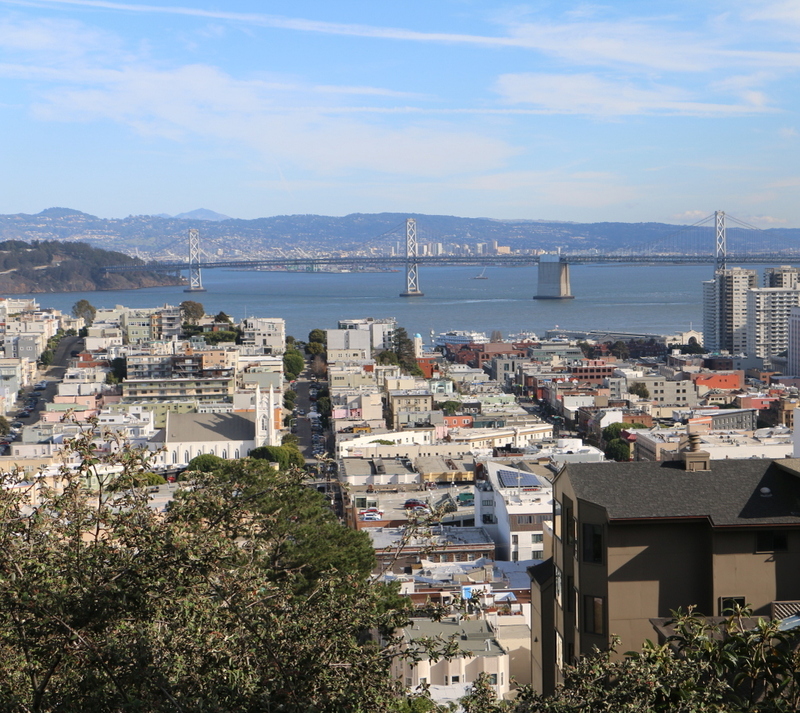 It was hard to get to the exact location of the original image, because most of Russian Hill is now covered in buildings. However, this view from the top of Vallejo Street just east of Jones Street was pretty close. The first photo was taken in the early years of San Francisco’s history, when the city was in the midst of a rapid population boom. By the mid-1860s, the initial Gold Rush was over, but the city continued its dramatic growth, increasing from about a thousand in 1848 to nearly sixty thousand in 1860. By 1870, the population was nearly triple that, and the section of the North Beach neighborhood seen here was completely developed. The three streets in this view are, from left to right, Green Street, Vallejo Street, and Broadway Street. At the time, the area to the right of Broadway Street was part of the city’s infamous “Barbary Coast” – a red light district that attracted miners and sailors with drinking, gambling, prostitution, and entertainment. This continued until 40 years after the first photo was taken, when the entire area was destroyed by the 1906 earthquake and the fires that followed. Today, the only identifiable building remaining from the first photo is the Saint Francis of Assisi Church, on the left side of Vallejo Street at the corner of Columbus Avenue. It was built in 1860, and although the fires in 1906 gutted the building, the brick walls and towers remained standing. The interior was rebuilt and rededicated in 1919, and today it is the National Shrine of Saint Francis of Assisi. Remarkably, though, despite all of the changes to the neighborhood, the church still stands out as a major landmark. Unlike the nearby Financial District to the right, the development in this area is still largely two and three story buildings, so the view really doesn’t look dramatically different from 150 years ago. The one major change, of course, is the Bay Bridge in the distance, which was completed in 1936, connecting San Francisco to Yerba Buena Island on the left and Oakland on the other side of the bay.